Scrupulously edited and checked against a vast range of Russian and Western archival evidence, The Maisky Diaries offers a fascinating revision of the events surrounding the Second World War. The terror and purges of Stalin's Russia in the 1930s discouraged Soviet officials from leaving documentary records let alone keeping personal diaries. A remarkable exception is the unique diary assiduously kept by Ivan Maisky, the Soviet ambassador to London between 1932 and 1943. 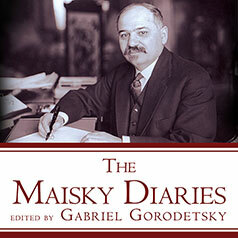 This selection from Maisky's diary grippingly documents Britain's drift to war during the 1930s, appeasement in the Munich era, negotiations leading to the signature of the Ribbentrop–Molotov Pact, Churchill's rise to power, the German invasion of Russia, and the intense debate over the opening of the second front. Maisky was distinguished by his great sociability and access to the key players in British public life. Among his range of regular contacts were politicians, press barons, ambassadors, intellectuals, writers, and indeed royalty. His diary further reveals the role personal rivalries within the Kremlin played in the formulation of Soviet policy at the time. Scrupulously edited and checked against a vast range of Russian and Western archival evidence, this extraordinary narrative diary offers a fascinating revision of the events surrounding the Second World War.